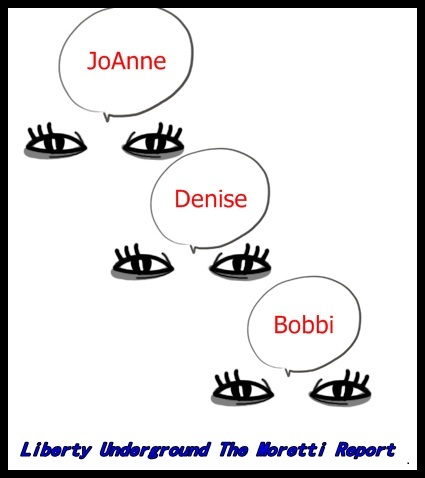 Liberty Underground The Moretti Report Debuts TODAY! Liberty Underground The Moretti Report is the newest conservative talk show to debut TODAY on the Freedomizer Talk Radio Podcast channel located on Blog Talk Radio. It will be hosted by JoAnne Moretti with associates Denise and Bobbi (this blogger) and an extensive group of researchers who will make special appearances, discussing current affairs, that matter to Patriotic Americans most. Listen in today and interact with us in the chat room. The scheduled shows will be each Monday, Wednesday and Friday every week 4pm EST – 6pm EST. Also see us interact on The Snoop Chick Friday nights 10:30pm-12:00am EST where JoAnne cohosts with The Snoop Chick! Guest is Casey Nunez who will talk about his recent travels along the gulf and his own experience with toxins from the ocean. He suffered tongue blisters, sore throat and sore lungs….don’t miss it. If you don’t know Casey Nunez, then you haven’t seen his videos on YouTube’s History Tour’s Channel. He really takes his charges throughout the New Orleans area with flair! However he also is a concerned citizen who is chronicling, on an almost daily basis, the travesty that is The United States of America Gulf Coastal region by video on the same channel. Who do you believe Casey Nunez, the citizens of the Gulf, real news sources like FOX, or the Bogus POTUS? Let your eyes and ears be your guide. Let common sense rule. What would Casey Nunez, the citizens living in the Gulf area or the news sources have to gain? Logic explains ~ they have nothing to gain! Many discussions occurred on Vicki Nissen’s The Snoop Chick’s Blog Talk episode tonight including a visit with Fred Nordorn who is running as the Candidate for House of Representatives MD 8th District (Constitution Party). The show topic was “What are Dispersants Doing to the Gulf and its Residents?” and Fred was given quite an overview of potential designations and damages that could befall the Chesapeake Bay area via JoAnne Moretti. Unfortunately there were many difficulties with the Blog Talk operations this evening and scheduled guest,Casey Nunez, probably had great trouble just trying to get through. However ShortRound82 (an avid listener of Casey’s) called in and advised Vicki’s listeners to catch some of the best video clips of the Gulf of Mexico events at jamescfox’s Channel. There was so much information packed into this one hour show. Hopefully, Casey can make it next week.